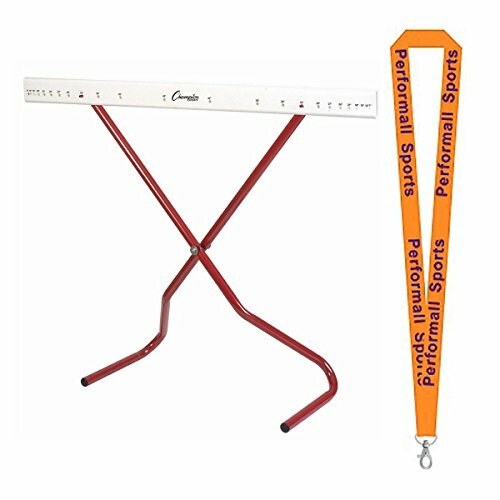 Bundle includes 1 Champion Sports Adjustable Training Hurdle Red / White and with 1 Performall Lanyard. The Champion Sports Adjustable Training Hurdle collapses for safety when hit, making it perfect for both beginners and those looking to advance their skills! Made with powder coated steel legs and a high impact plastic cross board, the hurdle adjusts to eleven different sizes, from 6" to 42". Bundle includes 1 Performall Sports Lanyard. The Champion Sports Adjustable Training Hurdle collapses for safety when hit, making it perfect for both beginners and those looking to advance their skills! Made with powder coated steel legs and a high impact plastic cross board, the hurdle adjusts to eleven different sizes, from 6" to 42"